The festive season is upon us. 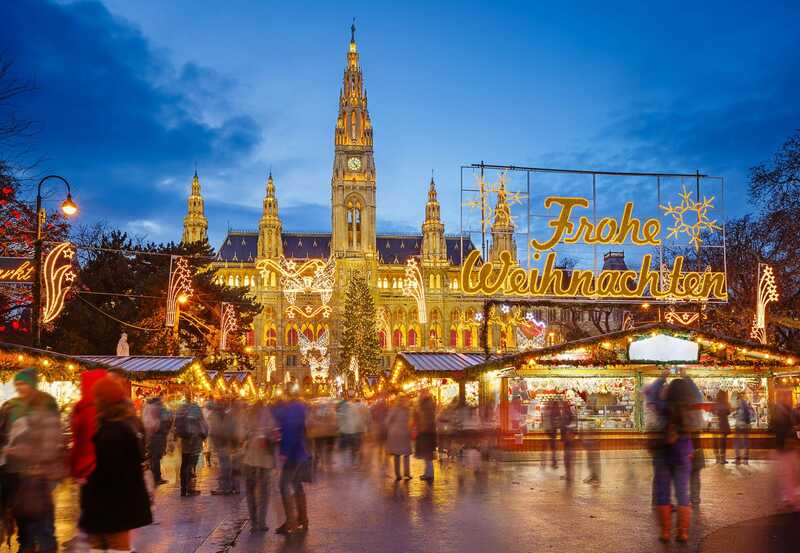 For Europe you know what that means – Christmas markets! While the winter weather may not be everyone’s cup of tea, the mood, lights and music that Christmas brings sure make up for it. Plus, a nice warm cup of mulled wine or hot chocolate doesn’t hurt in keeping out that winter chill. The problem is, Europe has so many epic Christmas markets everywhere that working out which ones you should travel for can be a huge challenge. There are just so many ways you can slice it: which have the best Christmas lights? The best food and drinks? The best tree? To save you the time and trouble of painstakingly trekking across Europe, we’ve compiled a list of the best Christmas markets in Europe. 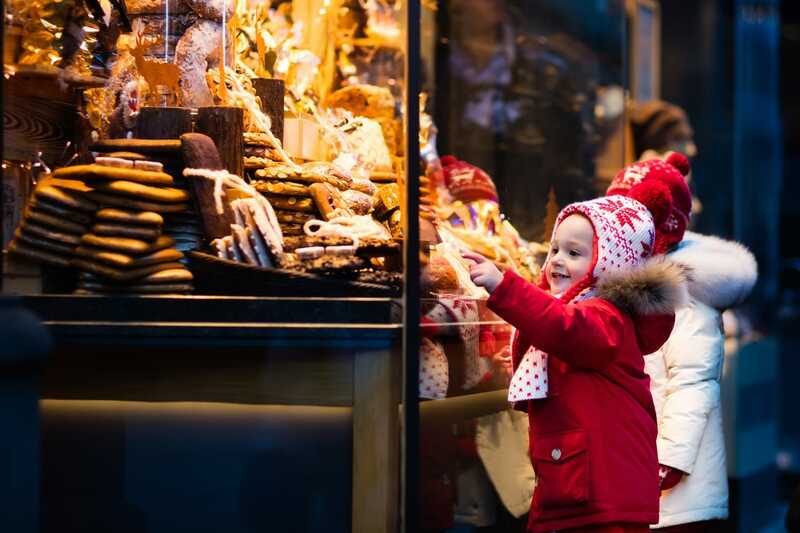 With these markets, you’re bound to have a blast experiencing Christmas with all the great local touches each of these cities adds. Get ready for a whole lot of Christmas cheer with these best European Christmas markets. 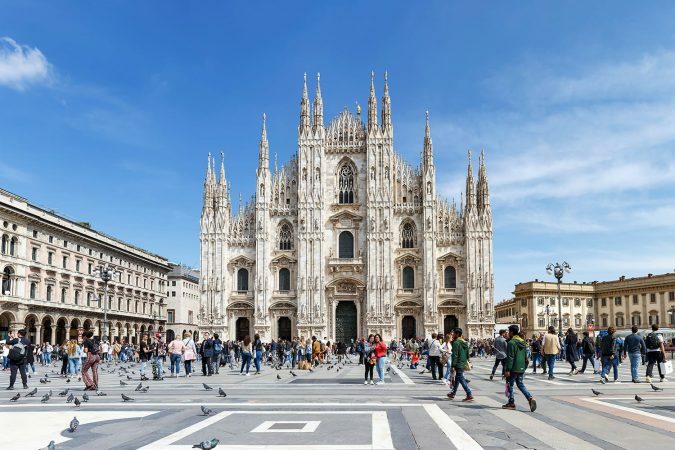 What’s better than visiting one of Europe’s grandest cities? How about seeing that city glowing with festive spirit. And make no mistake, Prague, which is normally a remarkably grand city, takes things up a notch when Christmas rolls around. 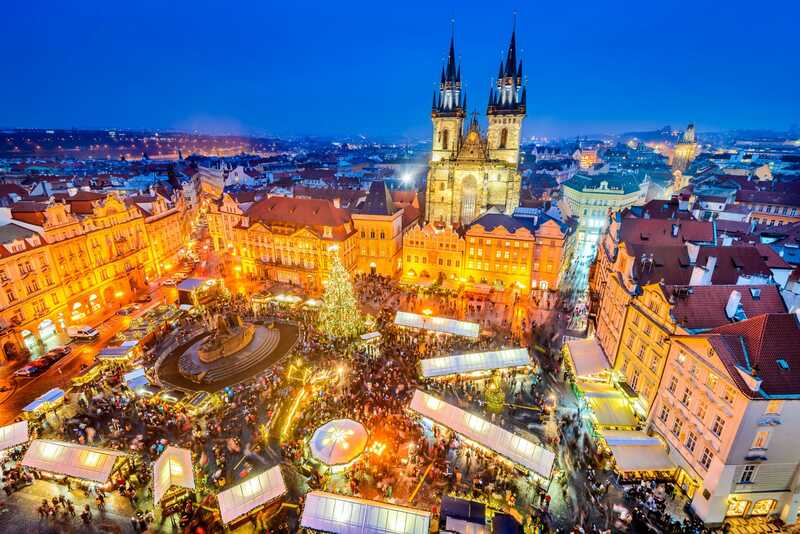 The Czech capital is known for being a place of good fun and that’s just amplified with the lead up to Christmas. Prague is a somewhat spread out city with interesting districts on both sides of the Vltava River, so it makes sense that it’s also home to quite a few Christmas markets. 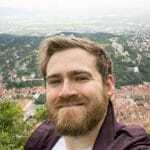 That being said, the main two Christmas markets of Prague are found by the city’s Old Town with the central Old Town Square and the great long Wenceslas Square. In case you’re going to just miss the start of these markets in December, the Christmas market up at Prague Castle begins a week early. The Czech people are famously the world’s biggest drinkers, so the great number of options for alcoholic drinks shouldn’t be a surprise. Along with hot mulled wine, a staple of Europe’s Christmas markets, you’ll also find mead, punch and grog, a concoction of rum, lemon, sugar and hot water. While there are plenty of foods to soak up the alcohol like sausages, pancakes and trdelník chimney cakes, perhaps the most popular is the simple ham on a spit. As for entertainment, the Prague Christmas markets in the Old Town Square include a small petting zoo with sheep, goats and a donkey. Then there are the folk groups and school choirs that perform on the main stage, completing the festive atmosphere. Vienna is a city transformed by the arrival of the festive season. Wrapped up in long-held traditions, the Austrian capital really makes an effort with Christmas and the results are hard to ignore. Throughout Vienna’s city centre, grand Christmas lights match the city’s imperial architecture and the promise of mulled wine and giant jam-filled donuts. 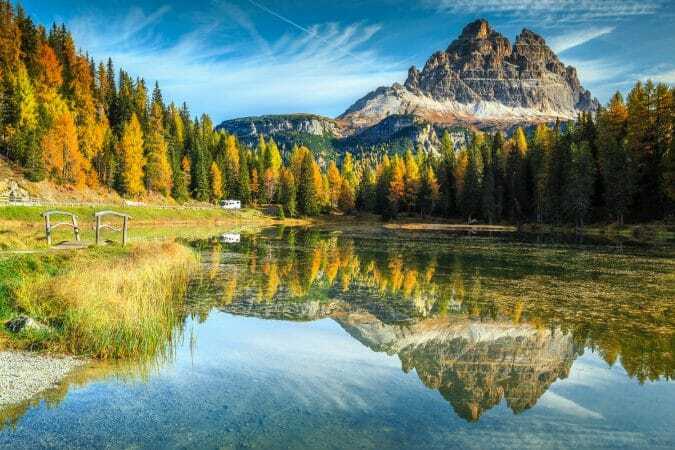 Across Vienna you’ll find countless Christmas markets, from grand ones like those on the grounds of Schönbrunn Palace and the Belvedere Palace, to small local ones in the outer districts. Surely the largest Vienna Christmas market though is the Rathaus Christkindlmarkt outside Vienna’s elegant City Hall. Sprawling out over the park in front of the Rathaus, ice skating tracks and light displays surround great long rows of market stalls. Here at the Rathaus Christkindlmarkt you can find anything and everything that make up a Viennese Christmas. Gifts, souvenirs and ornaments in all shapes and sizes are available, from shiny tree baubles to snow globes and wood or ceramic handcrafts. But the best thing about any Vienna Christmas market is the promise of food and a mug of something hot. The main drinks available include gluhwein, which is hot mulled wine, and punsch, a mix of wine, fruit juices and spices. If you’re after something stronger, go for the turbo punsch, which is punsch with a hit of a spirit like rum or schnapps. On the food front, there’s bauernkrapfen – oversized donuts, käsespätzle – Moorish cheese pasta, and of course pretzels and bratwurst. 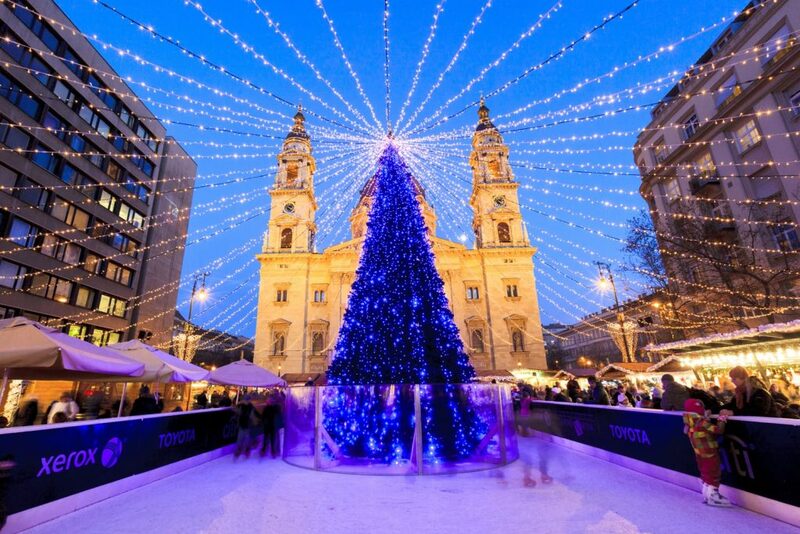 In recent years, one central European city has soared up the ranks of the best Christmas markets in Europe – Budapest. The Hungarian capital city has really come into its own as a major tourist destination the last few years, surely in no small part thanks to its Christmas celebrations. 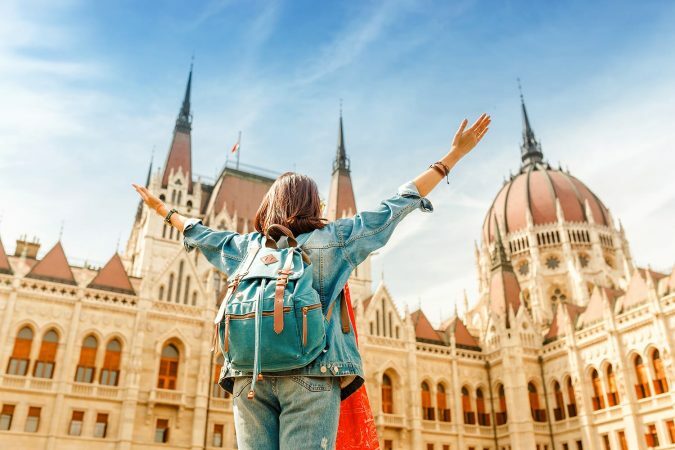 It’s easy to see the appeal of spending your days in Budapest sightseeing and soaking in the famous thermal baths and then your nights eating and drinking under Christmas lights. The two best known Christmas markets of Budapest are found in the central District V, Vorosmarty Square and St. Stephen’s Square. The Vorosmarty Square markets are Budapest’s oldest, most famous and certainly ones you can’t miss. Much newer are the markets outside the St. Stephen’s Basilica, which since 2011 have captivated locals and tourists alike with the ice skating rink and Hungarian folk art. And that’s one thing that’s really special about Budapest’s Christmas markets. 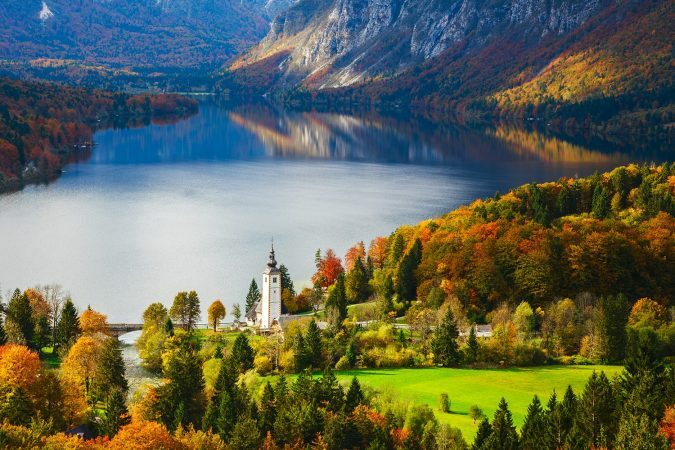 Real care is taken in making traditional handcrafts like glass-blowing, candle-making and leatherwork, as well as traditional Hungarian embroidery. It should become clear that here in Budapest, genuine traditional goods are emphasized over mass-commercial products because they celebrate and showcase Hungarian traditions. You’ll want to save space in your travel luggage for these souvenirs, that’s for sure. You’ll also want space for all the tasty goodies on offer. I mean, once you’ve laid eyes on kurtoskalacs, a.k.a. chimney cakes gently grilled and coated in cinnamon or almond, it’s going to be hard to say no to them. Then there are snacks like langos, fried dough with cheese and other things on top, as well as other hot foods like dumplings and sausages. Christmas markets and Germany go hand-in-hand, there’s no question. If you’re looking to visit a Christmas market in Germany, why not go for the best. Nuremberg’s markets are widely considered to be one of the best Christmas markets in Europe, if not the most famous. This medieval city in Bavaria is transformed come winter, as the main market square hosts the wildly popular Christmas market. With a history dating back to the 1500’s, they must be doing something right! While Santa or baby Jesus may be the star of most markets, Nuremberg’s comes in the form of the Christkind. This local icon is played by a young local woman dressed like an angel with golden wings and a crown, symbolizing the spirit of the Christkindlemarkt. Here, the Christkind is the one to give kids their presents and is the figure for which the market is actually named. Getting to indulge in different foods and drinks is definitely one of the best reasons to visit Christmas markets and Nuremberg’s is no exception. While the traditional gingerbread known as lebkuchen sure is addictive, who can say no to sausages when in Germany? Here you’ll find Nuremberg sausages, three small sausages served in a bread roll that are sure to help fill you up. Then you can wash it all down with a nice warm mug of punch or gluhwein. Besides keeping you warm and full, the 100 or so market stalls also sell a wide variety of handicrafts from across the globe. The most curious gifts, ornaments and souvenirs though are all local creations, whether it’s the delightfully silly prune-men – handmade figures crafted from dried prunes and figs, or the special local ornament, the “Rauschgoldengel”, a gold foil angel that resembles the Christkind. This is one market that is hard to walk away from empty handed. 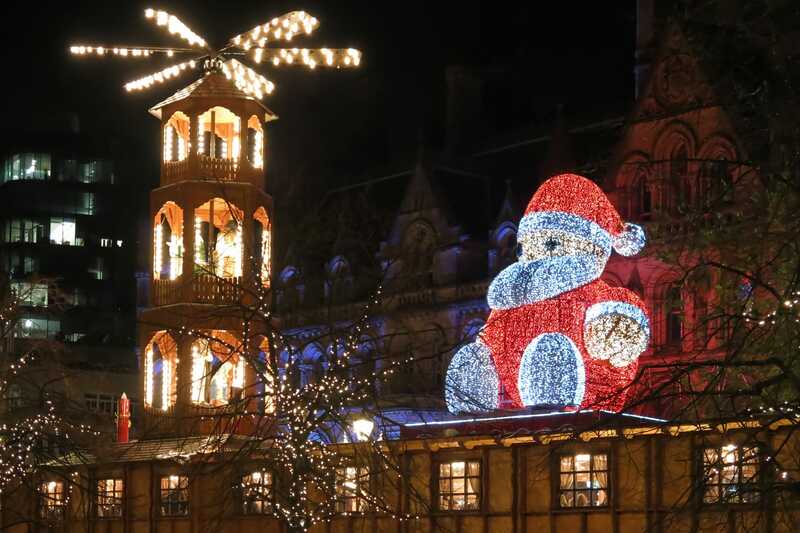 Come Christmastime in France you may be thinking of cities like Paris and Lyon, but it turns out that the Strasbourg Christmas markets are the place to be. 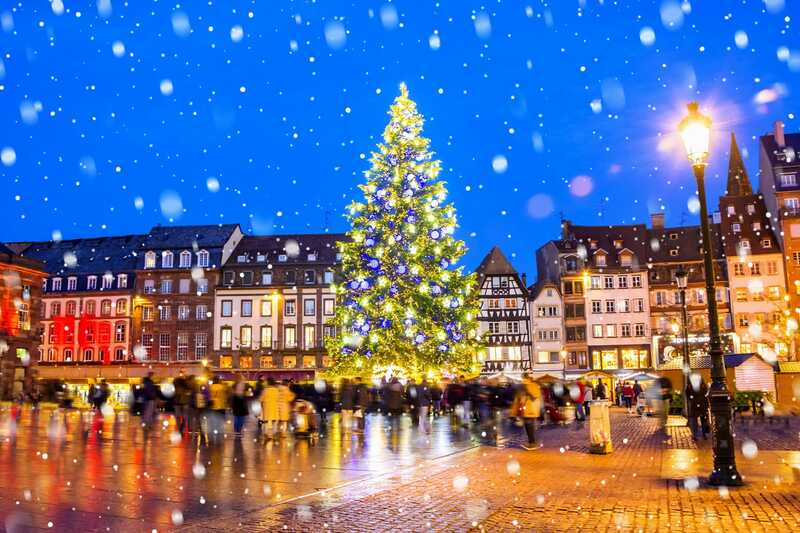 Nestled by the border between France and Germany, Strasbourg is widely regarded to be one of Europe’s best places to visit in the winter and around Christmas. It may not be a part of France that you have considered visiting before, but the festive season will have you looking at it in a whole new light. 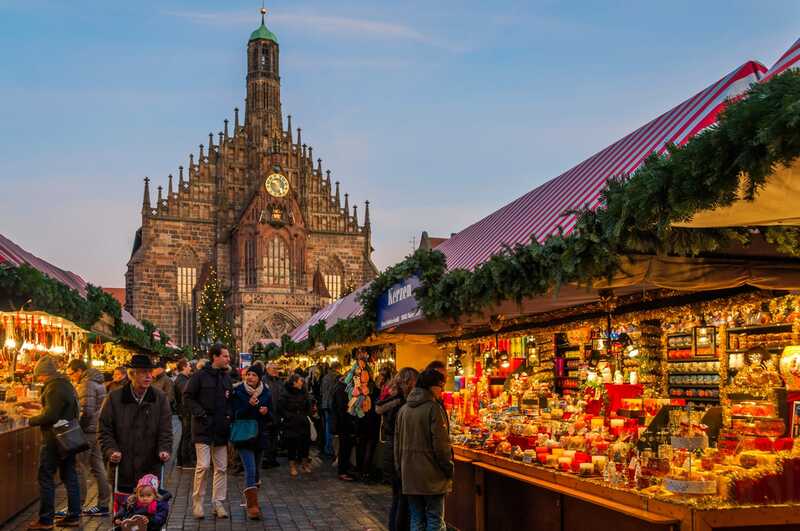 For starters, the Strasbourg Christmas markets known as Marché de Noël are simply massive, with over 300 wooden stalls spread throughout the city’s historical centre. There are even themed markets depending on which part of the city you’re visiting, such as “Magical Christmas”, “Alternative Christmas” and “Secret Christmas”. If you’re after the main market though, head to Place Kleber where you’ll find an enormous 30-metre high tree looming over you. Generally though, the Strasbourg markets place an emphasis on the regional traditions of Alsace, making it a distinctly local experience. 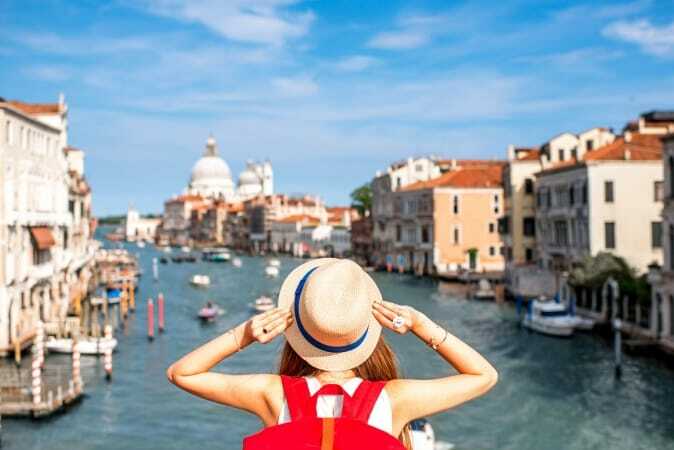 Besides seeing the different market themes, jumping from one market to the next allows you the chance to enjoy all the city’s magical illuminations that decorate streets, houses and churches alike. As for what you can find in each of these Christmas markets, you better believe there’s going to be plenty of food and drinks to make your tastebuds and stomach happy. Naturally, you’ll find hot mulled wine at the Strasbourg Christmas markets, where it is known as vin chaud. But you can also find special Christmas beers that have been brewed for the season. Then there are local treats like the Alsatian biscuits, bredele, which are made with various spices. With over 100 stalls stationed outside the Salzburg Cathedral, the Salzburg Christkindlmarkt is appreciated by locals and tourists alike. It’s likely that the atmosphere has something to do with it, thanks to snow drifting in off the Alps just over the horizon. Bright, cheerful Christmas lights and the radiating heat from roasting chestnuts do the job in combating the bitter winter weather. Much like in Vienna, the Salzburg Christmas markets will spoil you with varieties and flavors of gluhwein and punch, making you go back again and again to try all the different flavors. But for those who aren’t looking to drink, there are plenty of other ways to spoil yourself. There are stalls with umpteen different chocolates and cakes on display that are sure to satisfy a sweet tooth. But there are also all the ornaments and souvenirs to be had too, from bells and wreaths to little animal figures made from just about everything. It’s not only market stalls that make up the Salzburg Christmas market, but also Krampus parades, singing choirs and the reading of Christmas stories to kids. And Salzburg doesn’t just host Christmas markets in its Old Town, but they’re spread across the city from up in Hohensalzburg Fortress to out at Hellbrunn Castle. Sometimes rather than just one big Christmas market, European cities go the other way and have lots and lots of smaller markets. That’s the way Berlin seems to do it, often with somewhere between 60 and 80 separate markets scattered throughout the German capital. 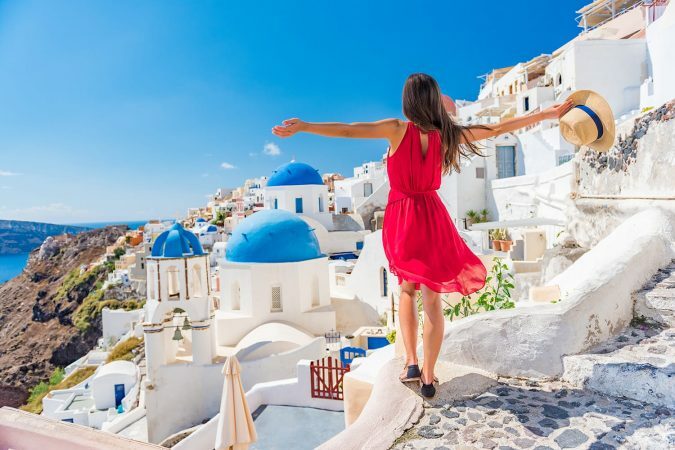 Odds are, at least one of those markets is going to suit you just right. If not, on to the next one! Still, having lots of markets is no good if none of them are all that good. Thankfully, Berlin doesn’t have that problem. So that you’ve got somewhere to start with the city’s markets, look for the Berliner Weinachtszeit market behind Alexanderplatz and Potsdamer Platz with its Winterwelt. The former features a massive ice skating rink and ferris wheel, while the latter has a huge luge that is big enough for people to actually ride down. The market at Potsdamer Platz is also popular because it starts in early November, weeks before most others do. 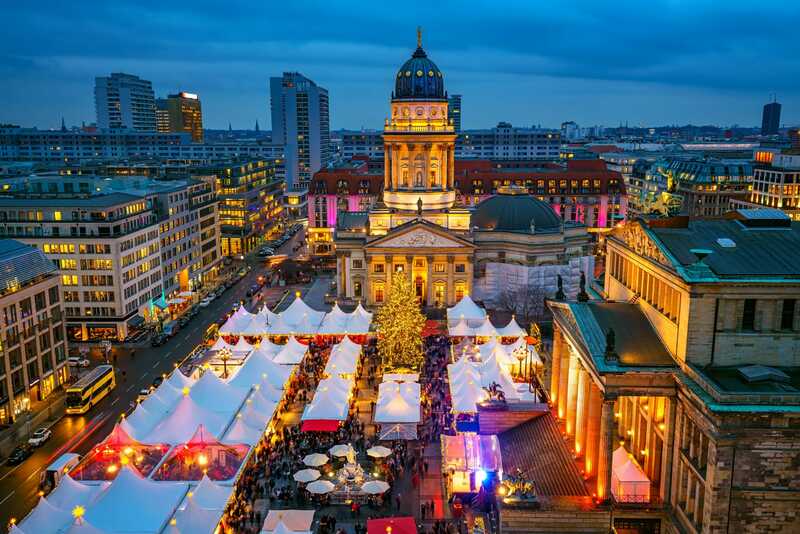 Since both of the above sound a little bit special, head to the more traditional Weihnachtszauber am Gendarmenmarkt. With its prime location among many of Berlin’s landmarks, it’s at this market where you can find all sorts of handcrafted gifts and souvenirs. And if shopping isn’t entertaining enough for you, the Weihnachtszauber am Gendarmenmarkt plays host to daily Christmas plays. No matter which Berlin markets you find yourself at, there’s certain foods you should keep an eye out for. Crowd-pleasers include schmalzkuchen – basically mini doughnuts, lebkuchen gingerbread and more international fare like gulash and hot chips. All of this can be easily accompanied by a nice warm gluhwein or nice cold draught beer. Some places just get how to do winter and Christmas, and Copenhagen is definitely one of them. Given its northern location, it makes sense that locals would want to do something to combat the long nights and cold weather. Well, the Danish capital goes the extra mile, taking many of its already pretty attractions and dialing them up to 11. If you love Christmas lights, it doesn’t get better than a visit to the Tivoli Gardens amusement park of Copenhagen at Christmas. All through the gardens you’ll find dazzling lights, whether they’re twirling on the rides, reflected in Tivoli Lake, glinting through the gardens’ trees or draped all over the NIMB hotel. Beyond its lights, Tivoli is also home to rides, theatre performances, a huge tree and countless food and craft stalls. The only downside to visiting the Tivoli Gardens Christmas markets is that you need to pay an entrance fee of 120 KR to enter the park just as you would any other time of the year. Other (free!) 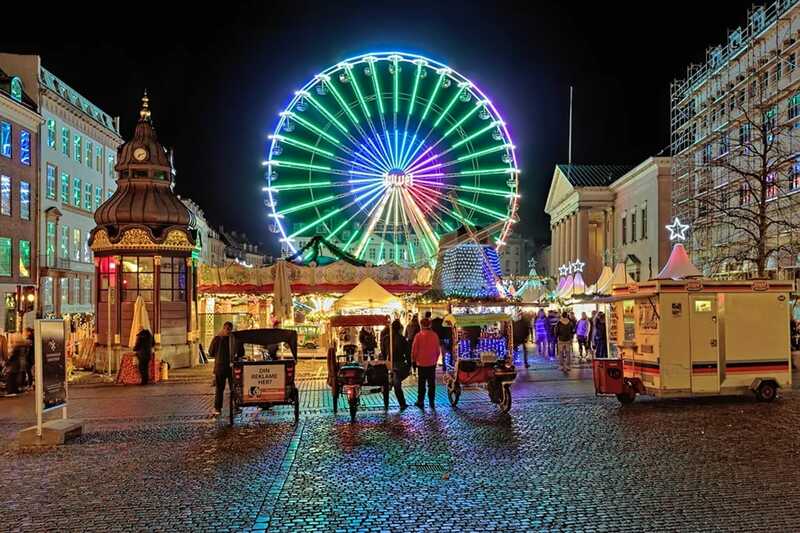 Christmas markets found around Copenhagen include one at the iconic and colorful Nyhavn harbour, one at Freetown Christiania and another at Kongens Nytorv square in Copenhagen’s Old Town. No matter which Copenhagen Christmas market you visit, there will be plenty of Danish food and drinks you have to try. Of course, the Danes have their own warm mulled wine known as gløgg, which is sure to warm you up. For the kids and those who don’t drink, hot chocolate is also on the menu and goes great with æbleskiver, a sort-of ball-shaped, fluffy pancake. Another great Danish food choice found around Christmastime is flæskesteg sandwiches, filled with delicious roast pork. 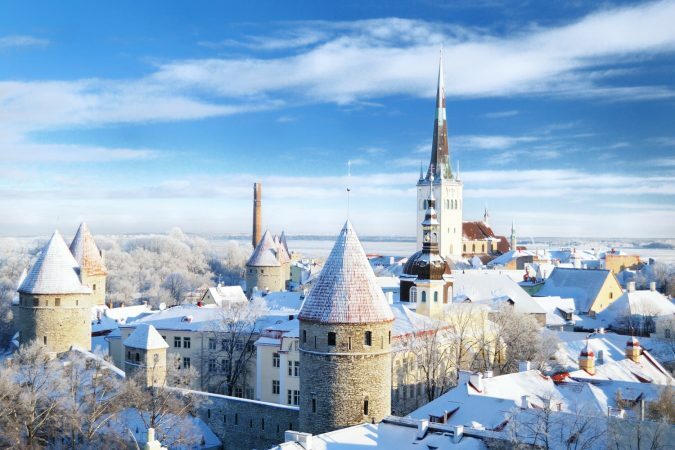 Atmosphere is a big part of these winter festivals, and it’s hard to find a more ideal setting for a Christmas market than Tallinn’s magical Old Town. 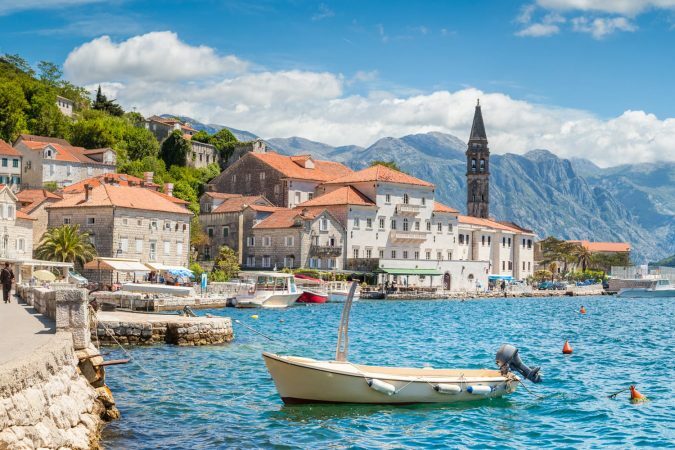 A much loved UNESCO site, this perfectly preserved walled old town feels like it belongs in a fairytale, especially when dusted with a little gleaming white snow. From the end of November through early January the Old Town is home to a can’t miss Christmas market. Although modern markets in Tallinn have only been going on for 20 years, the tradition of raising a Christmas tree in Town Hall Square dates back to 1441. Sitting plum in the centre of the central Old Town square, the beautifully illuminated tree is surrounded by market stalls and fairy lights. The square also hosts a stage where performances of song and folk dance further embrace traditional elements of Estonian culture. 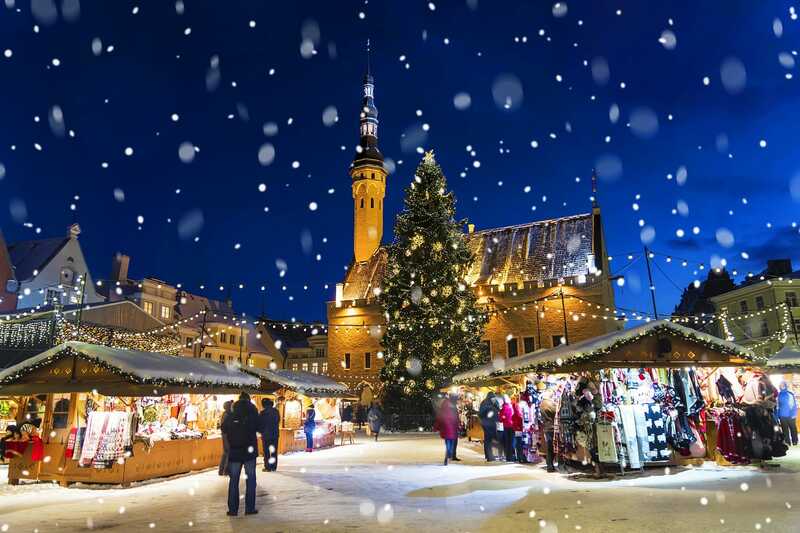 Unlike some of the markets on this list, the Tallinn Christmas market trades in size for intimacy and atmosphere. Kids are sure to have a great time as they ride on carousels and get the chance to meet Santa himself in his cottage. Adults are bound to enjoy themselves too, with plenty of locally made handcrafts and food on hand. A cup of hot mulled wine, a handful of Estonian gingerbread and the smell of blood sausage and sauerkraut are bound to do the trick. Europe’s mainland tends to get most of the attention when it comes to Christmas markets, but what about the UK? Turns out Brits don’t have to travel all that far to find some world-class Christmas markets as Manchester has some great stuff in store for visitors to the north. Only a recent inclusion to the city having started in 1999, Manchester Christmas markets have since boomed in both popularity and size. Centred on Albert Square, the Christmas markets of Manchester sprawl out with market stalls finding their way down nearby lanes. It’s at Albert Square though that you’ll find the market mascot Zippy, as well as a double-storey German beer house. Why go to Germany when you can have the beer and festive spirit brought to you? For entertainment, visitors can take a break from shopping and enjoying the international food on offer with a skate around the market’s ice rink. There’s also the new addition to the Manchester Christmas markets in 2018 of an ice sculpture village, where wonderful figures have been fashioned out of ice. Beyond Albert Square, other markets can be found throughout Manchester’s city centre. There’s even a Christmas karaoke pop up hut in the Spinningfields district. Hopefully reading through this list of Europe’s best Christmas markets has got you both ready for the upcoming festive season and given you ideas for a special Christmas getaway. The best thing about Europe is that each country celebrates something like Christmas in their own way, so there’s always something fun and new to experience.